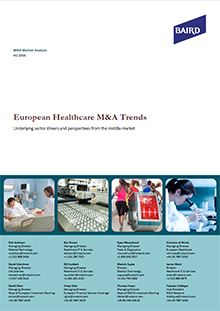 In this report and the video below, Baird discusses the market and M&A trends in the medical technology, life sciences, pharmaceutical, outsourcing, healthcare IT and healthcare services subsectors. Baird analysed over 200 middle-market M&A transactions in Europe. The average valuation multiple in Baird’s analysis was 11x EBITDA. Learn more about Baird’s Healthcare Platform.